At the AGM on Saturday 30 March, ALL committee positions become vacant and whilst the existing committee have predominantly been the only ones to renominate each year, that will not be the case at the end of this season with at least six of the current committee not returning next season as our athletes end their little athletics journey this season. In order for Golden Grove Little Athletics Centre to continue to be one of the best and biggest Centres in SA, we need many new parents to step up and join. To see all the roles that need filling, go to the Committee page on our website and download our Committee Role description and objectives document. Whilst we do not want to sound dramatic, the reality it that without quite a few new parents joining the committee and performing the other roles there is a strong chance that GGLAC will not exist next summer! If you are interested in being a part of the future of GGLAC, download the Committee Nomination Form and return the completed form either via email or to a committee member at a home meet or AGM. Refer our Event Calendar for details of all upcoming events and download the Age Group Roster for the Setup and BBQ allocations. Come and Try are welcome at any Home Meet on the calendar. Participants must be registered with either a Season Membership or as a Come and Try, click on either button to the right or go to our Membership page for more details. To find out when Training is being held and what is on, go to the Training page for all the details. Please note that the events listed are subject to change based on the weather and numbers in attendance. Cancellations will be posted on our Facebook with as much notice as we can provide. We are always on the lookout for parents to become qualified as either a Coach, Official or both! BECOME A COACH – To obtain the basic qualifications you can complete the Introduction to Coaching Course or the Level 1 Community Athletics Coach Course. GGLAC is able to assist with the cost for these courses and we ask you to read our Coaching Policy and speak to one of our coaches or a committee member for more information. BECOME AN OFFICIAL – In order to record and recognise Centre Records at a local level you must be Level 1 Qualified in that event. To complete the theory component of all events is FREE and just requires your time to complete the relative courses. None of these course are hard to complete, they also allow you to jump back through the course to review the information. Here are the basics to get you started. Level 0 of the course is not compulsory, it is strongly recommended you complete the modules. Level 1 – There is a module for each event, you can complete just 1 in a particular event, a few, or all the modules. For example, if you only complete the Long Jump module, you will only be qualified to judge Long Jump and no other events. We recommend you complete all the events in Little Athletics to have a full understanding of them all. All modules can be completed in your own time and we ask that you email us your Certificate of Completion for each module so we know who is qualified. Again speak to any of our Committee if you are interest or wish to know more. 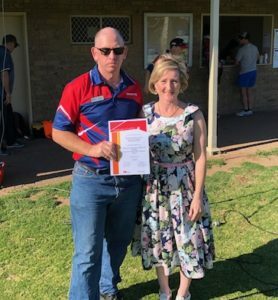 Thanks to our special guest, Paula Luethen MP – Member for KING for coming along to our Home Meet #1 yesterday to present us with our $5,000 Office For Recreation And Sport Active Club Grant. The grant proceeds were used to assist purchase the new (red) high jump mat that was used for the first time yesterday. With two full sized mats, we are now compliant with the new regulations that come into affect next season for all our older athletes. We hope to have another new mat for the younger athletes in the near future. Thanks must go to Jodie on our Committee who spends countless hours applying for various grants in order for us to improve our facilities and equipment for the benefit of our little athletes.